Goldust had actually debuted in fall 1995 and was the polar opposite of "The Natural" character Dustin had perfected in Atlanta. Goldust was a character way ahead of his time and paved the way for the infamous Attitude Era. Goldust entered into a war of words and love notes with Intercontinental Champion Razor Ramon. That brewing battle came to a head at the '96 Rumble. Full disclosure, Goldust is one of my favorite gimmicks of all time. Dustin jumpstarted his career with the character and changed the face of wrestling at the same time. When he headed to the ring that night, he was joined by a beautiful woman in a golden dress and carrying cigar. We'd later learn her name was Marlena. She was Dustin's real life wife who had played Alexandra York in WCW. By the way, Terri was the guest on the one-year anniversary show of My 1-2-3 Cents the podcast and you can listen to the backstory here. Underneath the wig and makeup, of course, is an amazing wrestler. Goldust and Ramon had a great match which saw some distractions from Marlena and interference from the 1-2-3 Kid who had recently turned his back on Ramon. I celebrated the victory as I watched live in my apartment one month removed from graduating college. I had just bought a computer and this was my first event with internet access. I talked about the victory with other AOL chatters and in rec.sports.wrestling. 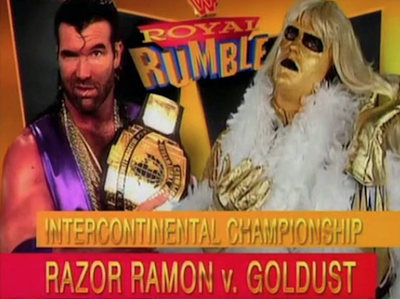 I wish Goldust's run as champion would have lasted longer. He ended up battling "Rowdy" Roddy Piper in a Hollywood Backlot Brawl at WrestleMania 12 a couple months later. The title wasn't on the line. The championship was vacated after an indecision with Savio Vega, but he recaptured shortly after that and lost it to Ahmed Johnson at the King of the Ring in summer 1996. Despite that, the chase and the title win is one of my favorite moments from Dustin's career and obviously my second favorite non-Rumble Royal Rumble match. I really will remember the name... Gooooollllduuuussssttt!